If you are a female in the United States you have probably heard of a mammogram. You may know that they are an important screening protocol to detect cancer in breasts and that women should routinely get them once they have reached a particular age (commonly people believe this age to be 40 or 50). And, while these things are correct, there is much more to mammograms. Mammograms are a critical tool used to detect cancer, and, when routinely scanned, catch cancer in the early stages which improves survival outlook. Many women are scared to get mammograms because they have heard they can be painful or uncomfortable. Because of this, it is important to understand what exactly a mammogram is and what it feels like. The National Cancer Institute explains what a mammogram is, “A mammogram is an x-ray picture of the breast. Mammograms can be used to check for breast cancer in women who have no signs or symptoms of the disease. 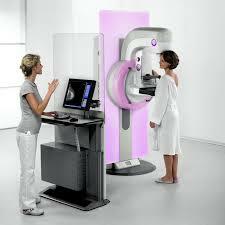 This type of mammogram is called a screening mammogram. Screening mammograms usually involve two x-ray pictures, or images, of each breast. The x-ray images make it possible to detect tumors that cannot be felt. Screening mammograms can also find microcalcifications (tiny deposits of calcium) that sometimes indicate the presence of breast cancer. Mammograms can also be used to check for breast cancer after a lump or other sign or symptom of the disease has been found. This type of mammogram is called a diagnostic mammogram.” The Office of Women’s Health describes what to expect during a mammogram and what it may feel like, “You stand in front of a special x-ray machine. The person who takes the x-rays, called a radiologic technician, places your breasts, one at a time, between an x-ray plate and a plastic plate. These plates are attached to the x-ray machine and compress the breasts to flatten them. This spreads the breast tissue out to obtain a clearer picture. You will feel pressure on your breast for a few seconds. It may cause you some discomfort; you might feel squeezed or pinched. This feeling only lasts for a few seconds, and the flatter your breast, the better the picture. Most often, two pictures are taken of each breast — one from the side and one from above. A screening mammogram takes about 20 minutes from start to finish.” With a full understanding of what a mammogram is and what it will feel like, the next question is – will it really help? How reliable is it? And, when should I start getting routine mammograms?